Beets are nutritious and easy to grow. They are biennials that are grown as annuals, and they are primarily grown for their roots, which are most often dark red and globe shaped. 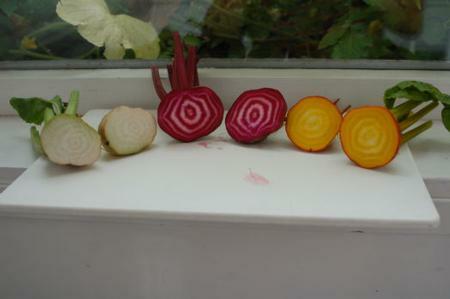 Some varieties are tubular in shape, and some are golden yellow, white, or have concentric rings of red and white that look like a bulls-eye when sliced. The beet tops, when young, may also be harvested for greens which are excellent in salads, and older foliage can be cooked. European natives, beets are known botanically as Beta vulgaris; they are in the Chenopodiaceae (Goosefoot) Family, which also includes chard and spinach, so avoid following these crops in rotation. Rotating crops in the garden can be effective against insect and disease pests that develop on crops of the same family, so moving crops to different sites isolates such pests from their food source. Additionally, plants in the same family can deplete the same nutrients from the soil. If possible, avoid growing beets, chard, or spinach in the same spot year after year. Being a cool-season crop, beets grow best in the cool temperatures of spring and fall; however, if they are planted too late in the fall (see Planting section below for optimum planting dates), they often will not grow to full size before the cold weather slows their growth. If temperatures are high when the crop is maturing, some color loss and zoning (internal development of white circles) occur. Low temperatures (below 50°F) for 2-3 weeks after they have formed several true leaves may cause flower stalks to develop prematurely before plant roots mature, although many newer varieties are less sensitive to this problem. Beets grow best in a sunny position in light, well-drained soils. Add organic matter (such as compost, well-rotted manures, composted pesticide-free lawn clippings, and composted leaves) to clay soils to improve soil structure and to help avoid surface crusting after rainfall. 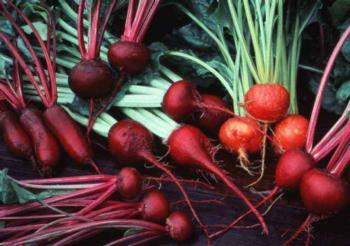 For poorly drained sites, consider growing beets in raised beds. When preparing the planting bed, be sure to remove stones and debris since they may hinder growth. Beets prefer soil with pH between 6.5 and 7, and their growth is stunted in very acid (low pH) soil. They are also sensitive to soils deficient in boron. It is a good idea to have the soil tested every few years to determine the soil pH and if any nutrients are deficient. This is particularly important if you are establishing a new vegetable bed. Apply a fertilizer that contains both nitrogen and phosphorus prior to planting. Work the fertilizer into the soil as the seedbed is being prepared. For additional information on soil preparation, see “Vegetable Garden Basics” (ANR Publication 8059) available at www.anrcatalog.ucdavis.edu. Beets are usually direct seeded (sown in the garden) rather than started indoors and transplanted into the garden. They may be planted late February to early April for harvest in the late spring, or mid-August to early October for harvest in fall to early winter. Successive plantings every 7–10 days during planting season will provide a continuous harvest over a longer period. Optimal soil temperatures for beet germination are 50° to 86°F, and the maximum soil temperature for germination is 95°F. To encourage rapid germination, place the seeds in a sieve and rinse them thoroughly under cold running water before sowing. This removes chemicals that inhibit germination. Immediately sow the seeds thinly (1-2 inches apart) at a depth of ½ inch in rows at least 12 inches apart to facilitate walking, weeding, and harvesting between the rows. If, however, raised beds or intensive gardening in blocks are being used, then row spacing may be reduced to 6 inches. Alternatively, seed may also be “station sown” which involves placing 2 seeds every 3-4 inches in rows either 6 inches apart (raised beds or intensive/block gardening) or 12 inches apart (standard row spacing) as stated above. Station sowing economizes the seed and makes thinning easier. Provided thinning is done to the final spacing in a timely manner (see Thinning below), station sowing and intensive/block methods provide a much higher yield for a given area of ground. Cover the seeds lightly with sand, compost, or soil; sprinkle lightly with water. Plant extra seeds of the golden beets as they germinate poorly. To help keep the soil moist for better germination, place floating row cover (a very lightweight spun bonded polyester or polypropylene fabric) or burlap over the soil and keep the fabric moist until the seedlings emerge, typically 5-14 days, but may take longer depending on soil temperature and moisture, weather conditions, and variety of beets grown. Keep the floating row cover loosely draped over the plants or supported by hoops to discourage insects early in the season. If the row cover is laid directly on the soil, do not stretch the material tight. Leave some slack in the center to allow for expansion as the plants develop. As the crop grows, it will push the cover up. Mound soil over the edges of the fabric to keep the cover in place, or insert fabric pegs or staples through the fabric and into the soil. If the row cover is supported by hoops, stretch the cover tightly over the hoops and bury the edges well to keep the fabric secure during windy days and to discourage insects. A common problem when growing beets is not adequately thinning the plants. Proper spacing is essential for a quality crop. Beet seeds have a different structure from other garden seeds. Each seed is actually a group of flowers that are fused together by the flower petals. This forms a multi-germ cluster which usually contains 2-5 seeds (note: some mono-germ varieties have only one seed per fruit.). Because several plants can germinate from one seed, thinning the seedlings in a timely manner is important. Thinning is best done in a couple of stages: (1) When the seedlings are 1-2 inches tall, start removing the smaller, weaker seedlings and leave the stronger, more vigorous plants. Cut, rather than pull, plants when thinning to avoid disturbing roots of other plants. (2) By the time the plants are 3-4 inches tall, thin again so that the plants should be at their final spacing of approximately 4 inches. The thinned plants can be used as greens. Any mechanical cultivation should be very shallow or the beet roots may be damaged. In order to obtain the highest quality, beets must make continuous growth. Beets require consistent moisture, so water deeply and thoroughly and do not let the soil become dry. Supplemental water may be necessary during dry spells. Underwatering will cause the outer leaves to turn yellow and the roots to become woody; however, overwatering can cause beet leaves to turn red and the plants to stop growing for a time. To conserve moisture and keep the soil from crusting, apply a 1- to 2-inch layer of mulch (such as straw, leaves, compost, or pesticide-free grass clippings) after the plants are well established. Keep the rows well weeded, and spray the growing plants once or twice with a foliar, seaweed-based fertilizer to help boost nitrogen, manganese, and boron levels. Fertilize mid-season with a balanced organic fertilizer and water evenly. Too much nitrogen fertilizer will encourage top growth at the expense of root development. Harvest begins about 45-65 days from seed sowing. Begin harvesting when the roots are at least 1 inch wide, harvesting alternate plants to allow remaining plants to grow up to 3 inches wide. Beets tend to get tough if left to grow any larger. To avoid damaging the roots, use a spading fork to gently lift the roots. Pull out the entire plant while it is still young, tender, and flavorful. Beets are fairly frost tolerant, and fall plantings can be stored in the ground over winter if well mulched, but they should be harvested before the soil starts to warm up, usually around mid-February. Once the soil begins to warm, the plant’s energy goes from root growth to seed development. Beet roots will keep in the refrigerator for up to 2 weeks. To reduce bleeding when cooking, leave 1 inch of the leaf stalk attached to the root and do not cut the root at all until after it is cooked. Harvest beet greens as you thin the seedlings and continue until the greens are too tough. The leaves are prepared the same as fresh spinach. Beets are biennial, which means they grow the first season when they are generally harvested, and if left in the ground over the winter, will send up a flower stalk that produces seeds the following year. Beets are wind pollinated and will cross-pollinate. The pollen is light and can travel great distances; therefore, varieties must be separated by at least 2 miles the second year when going to seed to ensure absolute seed purity. Harvest seed heads when they are completely dry. If seeds are kept in a cool, dry location, they should be viable for about 4 years. In home gardens, a bagging technique can be used to prevent cross-pollination; however, it may be more practical to purchase new seed. For more information about saving beet seeds, see Suzanne Ashworth’s book “Seed to Seed – Seed Saving and Growing Techniques for Vegetable Gardeners” (see reference on page 4). The best beet varieties for the Sacramento area are those with a short number of days from seed sowing to maturity (generally those with 60 days or less as listed on the seed packet). Sacramento County Master Gardeners have had success with the following varieties of beets: ‘Egyptian Turnip Root’, ‘Ruby Queen’, ‘Red Sangria’, ‘Detroit Dark Red’, ‘Golden’ (yellow), ‘Chioggia’ (red and white concentric rings when cut), and ‘Albino’ (white). The following table describes common beet diseases, pests, and other problems. For additional integrated pest management techniques, see “Pests of the Garden and Small Farm” (ANR Publication 3332) available at anrcatalog.ucdavis.edu, or check out UC IPM Online (Statewide Integrated Pest Management Program) at www.ipm.ucdavis.edu. Before using a pesticide, read the label, and always follow cautions, warnings, and directions. Small, circular spots with light centers and dark borders on leaves. Cercospora leaf spot (a fungal disease). Pick off and destroy affected leaves. Cracked roots and black areas on surface and inside roots. Stunted plants. Boron deficiency. Test soil; maintain pH between 6.5 and 7. Apply micronutrients. Leaf margins rolled upward; brittle leaves puckered along veins. Stunted plants. Curly top virus (spread by leafhoppers). Control leafhoppers that spread the virus by controlling weeds around the garden. Inadequate watering. Maintain adequate soil moisture. Flea beetle. Control weeds. Protect young plants with floating row cover or other protective cloths. Older plants are less likely to suffer damage. Overmaturity; drought. Harvest at proper time. Water consistently. Leafminers. Cover plants with floating row cover. Remove infested (mined) leaves. Leaves webbed together; eggs in rows on undersides of leaves. Beet webworms. Clip off webbed leaves. Destroy caterpillars. Control weeds. Plants stunted and wilted. Roots not well developed and have excessive fibrous roots. Warty swellings on fibrous roots and tap root. Nematodes. Existing infestations may be reduced through crop rotation, fallowing, soil solarization, and by adjusting planting dates (plant when soil temperatures are below 65°F). Plant Propagation, American Horticultural Society, 1999, DK Publishing Inc. Seed to Seed – Seed Saving and Growing Techniques for Vegetable Gardeners, (Suzanne Ashworth) 2002, Seed Savers Exchange, Inc.
April 2011. Written by UC Master Gardener Gail Pothour. Reviewed and edited by Chuck Ingels, Farm Advisor; Judy McClure, Master Gardener Program Coordinator; and UC Master Gardeners Dave Vaughan and Bill Pierce. To simplify information, trade names of products and company names have been used. No endorsement of named products or companies is intended, nor is criticism implied of similar products or companies that are not mentioned. Click here to download a printer-friendly version of Growing Beets in Sacramento, Environmental Horticulture Note 95 (PDF, 88Kb).